Absolutely beautiful! That basket is utterly amazing! Yeah, I wouldn’t give a toss what people thought of that ring if it was on my finger, as it’s just perfect. Look at that high crown! May I ask why it’s no longer yours to wear? So sorry to hear about losing your mum at such a young age. That must have been horrendous. It’s one of my worst fears, leaving my babies when they are still, well, babies. I want to see them grow up, make good decisions, travel the world & find happiness independent from what their dad & I provide. I love that bangle though & can almost hear the sound of many of them just from your description! Aren’t burglars utterly vile, hateful, selfish people. I can only imagine how much you would have treasured her rings if your passion for saving other old pieces is anything to go by! blingthing, Nitedula and StephanieLynn like this. Thanks @Alex T. It was never my ring per se but my mom let me wear it because I loved it. After Greg and I got engaged my mom felt it was no longer suitable for me to wear. LOL but it was OK to wear my great grandmother's engagement ring all through my single years. Go figure. In any case as much as I love the ring I see her point and probably wouldn't wear it as I don't like wearing a lot of rings and mainly just wear my ER and a band or 2.
westjenn, Keeliamira, AV_ and 2 others like this. My grandmother had an amazing collection of costume jewelry. This is a cuff bracelet of hers I happen to be wearing today (missing it's safety chain and a rhinestone ) Other pieces are a ring from other grandmother, sterling pieces I've had a long time including a band style ring with "waves", and a rubellite tourmaline ring ex got me after we moved in together. RosieR, bludiva, EllenS1 and 6 others like this. This is my Omega Seamaster Aqua Terra in a blue dial - I wear it practically every day. This is the same style as Daniel Craig wears in Skyfall. My grandfather was a watch collector of sorts, and also instilled in me a love for James Bond. Nowadays, my grandfather's dementia is so bad that he doesn't remember who I am (only that I am a familiar face), but I do feel very close to him every time I wear this watch. It reminds me of when he was healthier. westjenn, Natylad, blingthing and 13 others like this. Gorgeous watch and how meaningful it is for you. So sorry about your grandfather and glad this watch brings you happy memories. This is such a lovely, classic watch & I am glad you enjoy wearing it. I am so sorry to hear about your grandfather - very tough times for you, I expect. TheGarnetGirl, Alex T and AV_ like this. This is such a meaningful thread, with deeply personal stories and complete with beautiful bling! I'm glad everyone found solace in one way or another through their beautiful jewelry. DH and I knew each other since high school, were good friends for several years before deciding to date, and weathered a long-distance relationship of 7 years before marrying, hence the engagement ring reminds me of the need to be grateful and supportive when the going gets tough. I also love the ring for its symbolism - we both love nature and music, hence the ring has petal prongs and string instrument "f" sound holes. We also used my late grandmother's diamond melee for the scrolls, so I love that my grandmother is always with us on this journey. She was also a wonderfully generous woman that gave a lot to others despite not having much for herself, and is a role model. I greatly admire resilience and independence in people despite life-limiting illnesses. This ring was purchased from an etsy seller who had been through childhood chronic illness herself and is currently a mother to a boy with special needs. She openly shares about this on her store info (in case you are wondering if it is a breach of confidentiality haha). I really like that she is self-sufficient and making an honest living with her art despite life-limiting circumstances. Wearing a band from a resilient person makes me feel that strong! Incidentally, I also bought this ring as an "engagement ring" of sorts to myself, to remind myself to always "marry myself" and practise self-love. I associate green with life, nature and renewal, hence these studs are my go-to especially on challenging days. In my humble opinion, the color and glow of these emeralds are fairly spectacular and are very easy to love! AceofHearts, Keeliamira, Lykame and 13 others like this. Heart shape! Gorgeous! Emeralds..a fave. Thank you @FinleysMom! I know heart cut diamonds are not for everyone, but I'm personally very drawn to it. Most people do mistaken it for a round brilliant if they don't stare closely. The emeralds were a serendipitous find and get a lot of wear. I actually didn't think I would be able to find a Columbian matched pair at the size I wanted. @Sparkle_ruckle All very unusual & beautiful pieces! That heart is perfect & those emeralds have that glow about them that I would covet. Thank you for sharing! @Sparkle_ruckle Would you mind telling us the easy shop where the sweet lady made your eternity band? I'd love to see everything she makes It is so beautiful and delicate! And it looks perfect with your gorgeous pieces!! Your heart ring is one of my "most favorites"!! Sparkle_ruckle and suzanne2 like this. Thank you so much @Alex T , @jbake and @Simple and Sparkly ! You are all so sweet! Wearing jewelry has always been very personal for all of us, and I do cherish the piece a lot more when there's symbolism in both the design and the reason for gifting/buying. Thank you for loving my pieces as I do! @Simple and Sparkly, sure! The band is from MRoseDesign on Etsy. Happy shopping! I’ve never been sentimental about any jewelry piece (including my engagement ring from my prior marriage lol)...until now. I recently lost my dog to cancer and had this made in his honor. It brings me much comfort and I can definitely say this is one piece I’m never selling. rosemarygumdrops, iluvshinythings, Keeliamira and 9 others like this. The ring I just bought for myself ... my brother passed away leaving no kids ... so the ring is inscribed Memory of Wil Moro and I hope it becomes an heirloom. 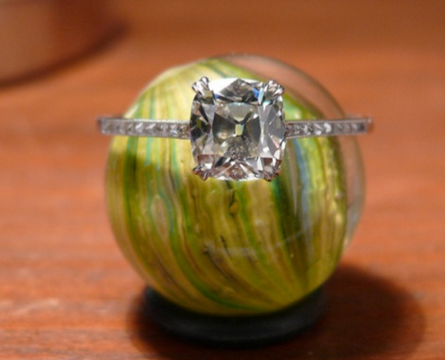 Of course it is the ring of my dreams, but I think of how my brother lit up my world every time I look at it. He would also have wanted me to have it ... I used money from the estate ... he left me everything - including a little house in Spain. RIP, my dear Wil. Keeliamira, TheGarnetGirl, suzanne2 and 7 others like this. So sorry for your loss. It’s a stunning ring and great tribute to your brother. suzanne2 and kmoro like this. suzanne2, partgypsy and kmoro like this. I am so very sorry for your tragic loss. It's a beautiful ring and tribute to your dear brother. I hope this ring brings you happy and comforting memories. Sure to become a family heirloom. Haha do it! I think of horses as just really big puppies anyways. I’ve been getting lots of compliments on it while at the beach! Ahh... it just looks perfect on you And the outline shape is so unusual that if I saw you in real like, i’d have to push closer to get a proper gander of what was actually going on with it! It’s definitely a keeper piece. Big hugs. Many thanks, @Alex T for this thread! I’ve so enjoyed reading it. My favorite Christmas gift was this hand me down from my mama. This watch has deep sentimental value for her, so for her to pass it onto me meant a great deal. Wearing it, I feel immensely grateful, proud, and loved. Also featured is my wedding set, which is constant, constant comfort for me. rinkyb and Alex T like this. Thank you, Alex! I’m so behind on being a dutiful PSer, I know!! But yes, I love wearing my full set. It feels so complete to me. More bling pics soon!! This is my comfort piece of jewelry. The piece that I love the most and which brings me joy every time I wear it and look at it. It is a 1.14 ct solitaire. I bought the diamond with my own money and had the setting custom made according to my own design. I love it because it reminds me of the fact that you don't need to be perfect in order to be wonderful and appreciated. You can be amazing and breathtaking even with your little flaws. It is a unique and wonderful to me SI2 stone. I have never loved a piece of jewelry as much as I love this ring. Sparkle_ruckle and Alex T like this. I love your ring ♥️ Can you have a closeup if that beautiful setting?